Stopping by or there for the long haul, Burleigh Heads is so much more than just a pit stop between Surfers Paradise and Coolangatta. From knockin’ back frothy boys at breweries to fine dining by the water – Burleigh is proving it’s ahead of the pack when it comes to a damn good spread. Eating right on the beach without getting sand in your salad isn’t easy, until now. Burleigh Pavilion has crept up onto Burleigh Beach with a balmy venue that’s completely nature proof (the worst bits of nature anyway, so long literal sandwich). Drink in the sea breeze and a Tropic Slipper while you’re at it, with the option to sip and splurge at either one of the venues two split sections – The Pavilion and The Tropic. For the love of Poseidon don’t wear your thongs to this one. If it’s not true blue, hooroo. Rosella’s is the most Australian thing to hit Burleigh since Vegemite, and you better believe they have plenty of that. 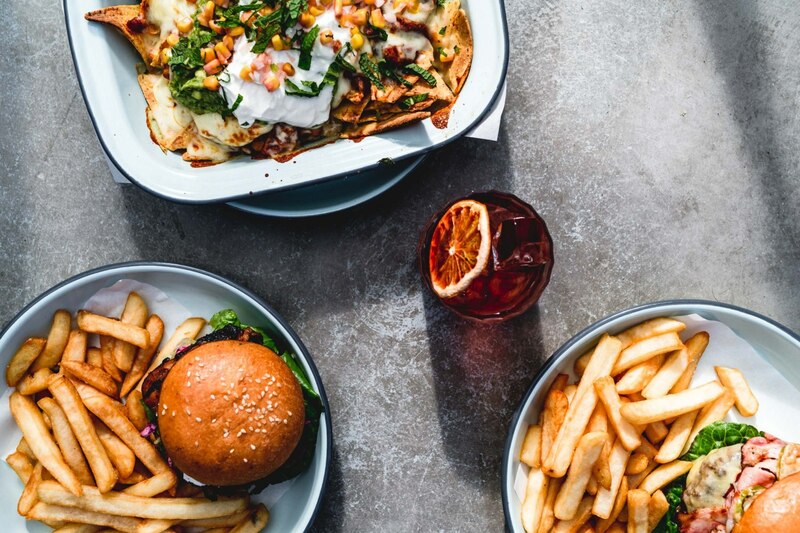 From bug sambos with caramelised onions, fresh dill and paprika aioli to Pasito cocktails and even a cheeky XXXX cocktail, all your senses will be deep in ‘straya mode. You beauty. Burleigh’s worst kept secret, Canteen Café is slinging modern, fresh food with traditional Middle Eastern flavours. Savour sautéed broad beans with potato, cherry tomatoes, poached eggs and garlic labneh or satisfy your sweet tooth with caramelised banana and dark chocolate ganache sourdough toast. While you’re at it, fuel up with a single origin coffee or get sassy with a spiced chai latte. Say haloumiiii to bagels, brekky bowls and bloody good burritos. Whether you’re an omnivore, herbivore, paleo or just plain hungry – you’re not going to bruschettabout Burleigh Social. Think you don’t have mushroom? You’ll find it for the big vegan when you tuck into Swiss brown mushrooms, avocado, roasted sweet potato, tofu and kale – or find yourself stopping for a coffee and staying for the chilli beef and bacon burger. Keen on a liquid lunch but would rather kill someone than drink kale? Beer might be more up your alley. Black Hops Brewery is the definition of DIY, and with an eight-tap cellar door you’d be hopping mad not to try them all. There are few restaurants more deserving of the name Fish House than this Burleigh gem. The carefully crafted menu changes daily, with the freshest seafood flown in every day from around Australia. Start with live Sydney rock oysters, pickled petuna ocean trout or whole baby calamari, before indulging in prawn bisque risotto with chive and bottarga. It wouldn’t be a true Burleigh guide if we didn’t mention the coveted pan-Asian jewel of the GC, Rick Shores. Keep it classy with delicate kingfish sashimi, yuzu, black sesame, lime and coconut, or warm up with hearty red duck curry with sichuan caramel, lychee and crispy duck skin. You can’t leave without trying their signature fried bug rolls, accompanied by a Rick’s Martini and a view. Food trucks, bangin’ tunes and a 24-tap line-up of some of the best damn brews in Burleigh, who wouldn’t want to spend a casual Sunday afternoon at Burleigh Brewing Co? Including regular favourites like 28 California Pale Ale, My Wife’s Bitter English Ale and Heff wheat beer, as well as addition one offs from their pilot plant, it’s no wonder this place is so popular. The biggest, cheekiest burgers in town might give you a heart attack – but you’ll definitely have a story. Keep it simple with the Chee-ze burger, with wagyu patty, maple bacon, fried onion straws, zp sauce and jack cheeze. Make it a double and throw in some pastrami fries too if you REALLY want to go ham, YOLO AMIRIGHT KIDS?! From pork belly and potato pizza to pear and rocket salad, Justin Lane is giving us Justin what we want from our favourite Burleigh pizzeria. Ogle mixed marinated olives, snack on San Daniele prosciutto before gorging on gnocchi and pigging out on pork and pear pizza on the rooftop. Uh…you might want to wipe the drool of your keyboard friend. Not just beaches and board shorts, get on ya bike and down to Burleigh Heads!